Uniquely shaped, this Cedar Falls Pedestal Sink from Fine Fixtures is reminiscent of a waterfall design. The front wall supports the sink with its curved shape and covers up all pipes beneath. With a clean, rectangular shape for the basin, this Cedar Falls Pedestal Sink has an eye-catching design that will give your bathroom a modern look and feel. 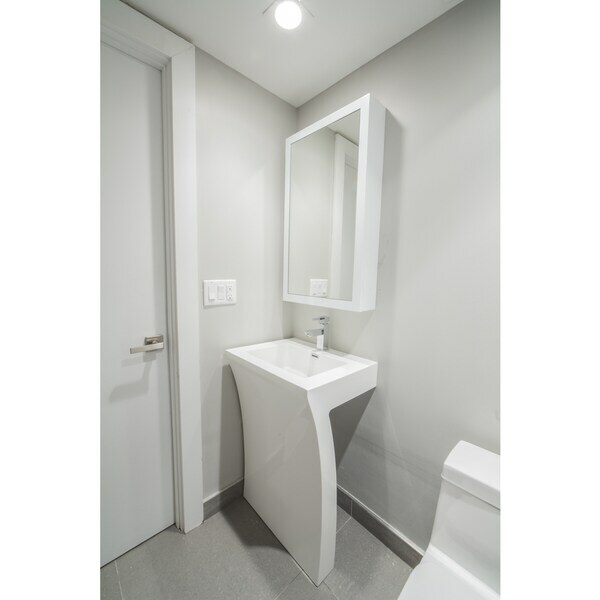 Measuring 34 inches high and freestanding, this acrylic pedestal sink comes fully assembled. Finished in matte white, this sink is suitable for any bathroom. First of all, the delivery of these items was remarkable. I have never received any large item packed so well. It was placed and wrapped on a little platform and all was delivered in one package. When I opened the package about 2 weeks later I was pleasantly surprised by a beautiful, sleek modern vanity, measurements were accurate . 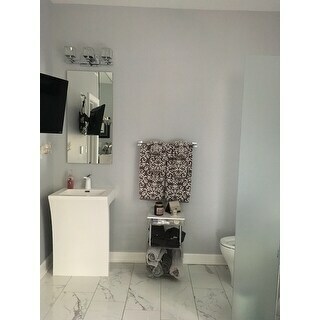 I wasn't interested in the medicine cabinet but after seeing it, my contractor was able to hang it. This is beautiful. Love it....Love it. Originally ordered on 6/13/17. Took almost a month to get. The product was already damaged when received. Contacted Overstock.com to ask how to get a replacement shipped but the Overstock CSR couldn't help me, She said someone else would get back with me to explain the process. It was two days before I was contacted by Overstock to follow up. That CSR was very helpful and very apologetic and ordered a replacement immediately. However, I still don't have the replacement on 7/27/17. "How much does it weigh? Is the faucet included?" The shipping weight is 150 pounds, faucet not included. "Is the finish shiny or matte? If shiny, is there a matte finish available? Thanks"
"What are the dimensions of the base?" This item is approximately 22.25 inches wide x 18 inches deep x 34 inches high.